This might be difficult to believe, but up until today Simone Biles had never won a world championship gold medal on the vault. In 2013, her first season as a senior, she placed second behind McKayla Maroney, due, in part to lower start values on her second vault. This would be a recurring theme up until Rio. While Biles’s first vault—the two-and-a-half twisting Amanar—was the best in the women’s field, her second vault kept holding her back. It was nearly a point back in start value compared to those of the other top vaulters in the women’s field. Biles still got exceptionally clean execution to stay close to Hong Un-jong of North Korea and Maria Paseka of Russia but never topped the vault podium at a major international competition until Rio when she finally upped the difficulty of her second vault. In the final today, Biles didn’t compete her eponymous vault. She had missed it in the all-around final. And in the apparatus final, the gymnasts didn’t get a chance to do a warm-up right before the competition, as they did in the team and all-around competitions. 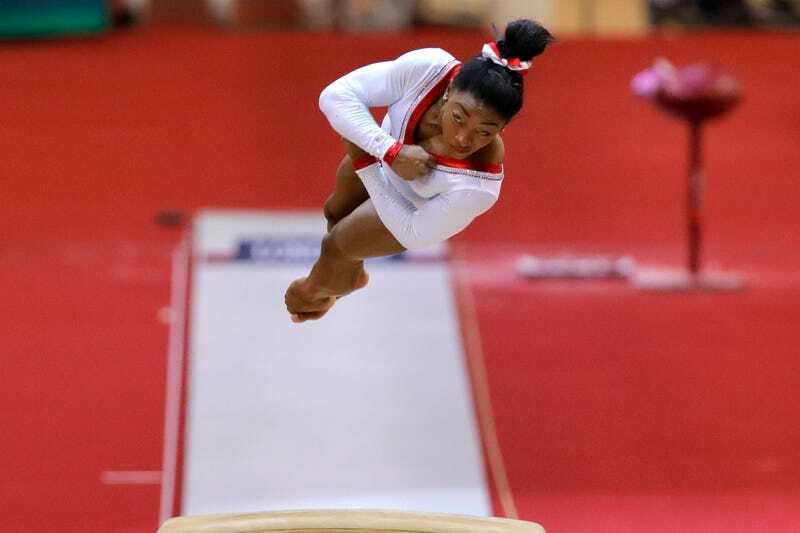 (This warm up is called the “one touch.”) Biles did the “easier” Cheng vault, which has one-and-a-half twists to the two of “the Biles.” This was definitely the right call. Biles came in high on the table and didn’t get a strong block off. Though she completed the one-and-a-half twists, she landed short and had to take a big step forward. Her Amanar, however, was high and clean, a thing of beauty as always. Even with the imperfect Cheng, there was no doubt that Biles would win. She topped the field by almost a full point. This gold medal means she broke a tie with Belarus’s Vitaly Scherbo for most world championships gold medals. The record is now 13 and the record holder is Biles. Also medaling in the vault final were Shallon Olsen of Canada in second and Alexa Moreno of Mexico with the bronze. This is the first women’s vault medal for Canada and the first women’s artistic medal of any kind for Mexico at world championships. Later in the uneven bar final, Biles picked up her first ever world championship medal on bars, a silver. (Between the vault and bars finals, Biles changed her leotard because judges had already seen the 1988 throwback leo in the vault final.) Since Rio, Biles had significantly improved on bars, which had formerly been her weakest event, lagging behind her other three. But in Doha, Biles had consistently put up top scores on this event and qualified into the final in second place, which is where she ended up when all was said and done today. And with this silver medal, Biles becomes the first American to medal on every single apparatus at the world championships. And in third place was Elizabeth Seitz of Germany. The 24-year-old has been a mainstay of bars finals for years but had never medaled until today. In Rio, she narrowly missed a medal after her countrywoman, Sophie Scheder, edged her by .033 for the bronze on that event. How Many Times Can Simone Biles Fall And Still Win Gold?